Pluto was demoted to dwarf planet status in 2006, joining Eris, Haumea, Makemake and Ceres. In 2006, an assembly of the International Astronomical Union voted to define a planet as a celestial body that a) is in orbit around the sun, 2) has enough mass for its gravity to pull it into a rounded shape (hydrostatic equilibrium), and 3) has cleared the neighborhood of its orbit of other, smaller objects. This last criterion is the point at which planets and dwarf planets differ. A planet's gravity either attracts or pushes away the smaller bodies that would otherwise intersect its orbit; the gravity of a dwarf planet is not sufficient to make this happen. Astronomers estimate that there could be as many as 200 dwarf planets in the solar system and Kuiper Belt. 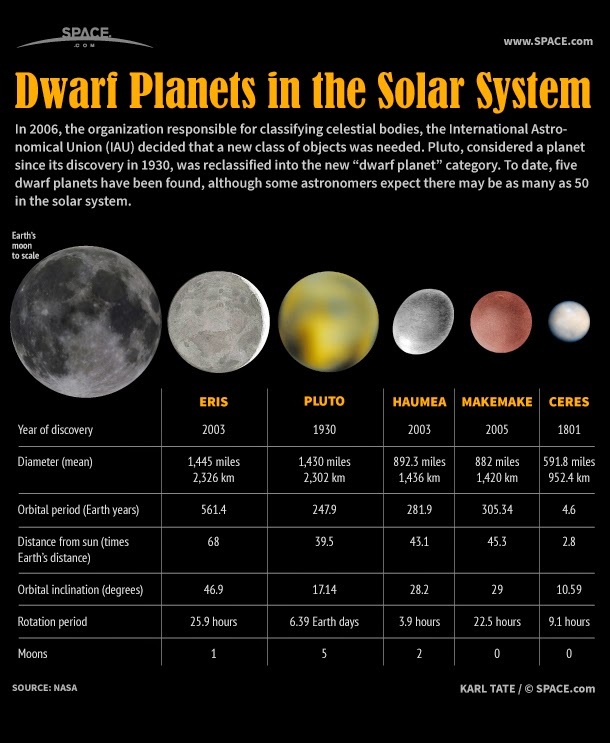 But the differences between planets and dwarf planets may not be obvious at first. IXV was launched 340 km into space atop a Vega rocket, VV04, from Kourou in French Guiana on 11 February 2015. After separation from Vega, IXV coasted to 412 km before beginning a punishing glide back through the atmosphere. During its autonomous flight, IXV tested the latest technologies and critical systems to extend Europe’s capability for space exploration. 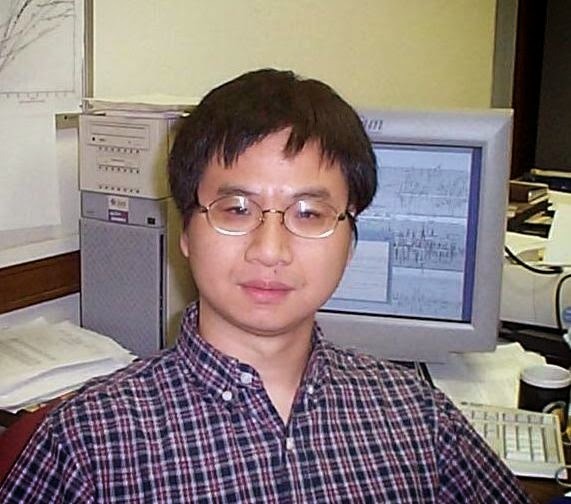 A research team from the University of Illinois and colleagues in China found earth's inner core has an inner core of its own, with crystals aligned in a different direction. Image courtesy Lachina Publishing Services. "Even though the inner core is small - smaller than the moon - it has some really interesting features," said Song. "It may tell us about how our planet formed, its history, and other dynamic processes of the Earth. It shapes our understanding of what's going on deep inside the Earth." Researchers use seismic waves from earthquakes to scan below the planet's surface, much like doctors use ultrasound to see inside patients. The team used a technology that gathers data not from the initial shock of an earthquake, but from the waves that resonate in the earthquake's aftermath. The earthquake is like a hammer striking a bell; much like a listener hears the clear tone that resonates after the bell strike, seismic sensors collect a coherent signal in the earthquake's coda. "It turns out the coherent signal enhanced by the technology is clearer than the ring itself," said Song. "The basic idea of the method has been around for a while, and people have used it for other kinds of studies near the surface, but we are looking all the way through the center of the Earth." Looking through the core revealed a surprise at the center of the planet, though not of the type envisioned by novelist Jules Verne. The inner core, once thought to be a solid ball of iron, has some complex structural properties. The team found a distinct inner-inner core, about half the diameter of the whole inner core. The iron crystals in the outer layer of the inner core are aligned directionally, north-south. However, in the inner-inner core, the iron crystals point roughly east-west. Not only are the iron crystals in the inner-inner core aligned differently, they behave differently from their counterparts in the outer-inner core. This means that the inner-inner core could be made of a different type of crystal, or a different phase. "The fact that we have two regions that are distinctly different may tell us something about how the inner core has been evolving," Song said. 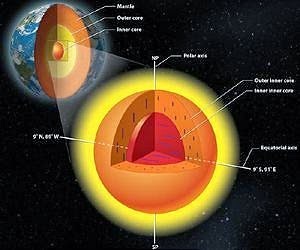 "For example, over the history of the Earth, the inner core might have had a very dramatic change in its deformation regime. It might hold the key to how the planet has evolved. We are right in the center, literally, the center of the Earth." The ‘McDivitt purse’ and its contents had been lost for four decades. The bag full of power cables and utility clamps may not have looked very interesting when Carol Armstrong found them stuffed in a closet in her Ohio home. Yet the items, which had lain hidden for more than four decades, were actually priceless mementos from the most famous space mission of all, during which her husband became the first person to walk on the Moon. 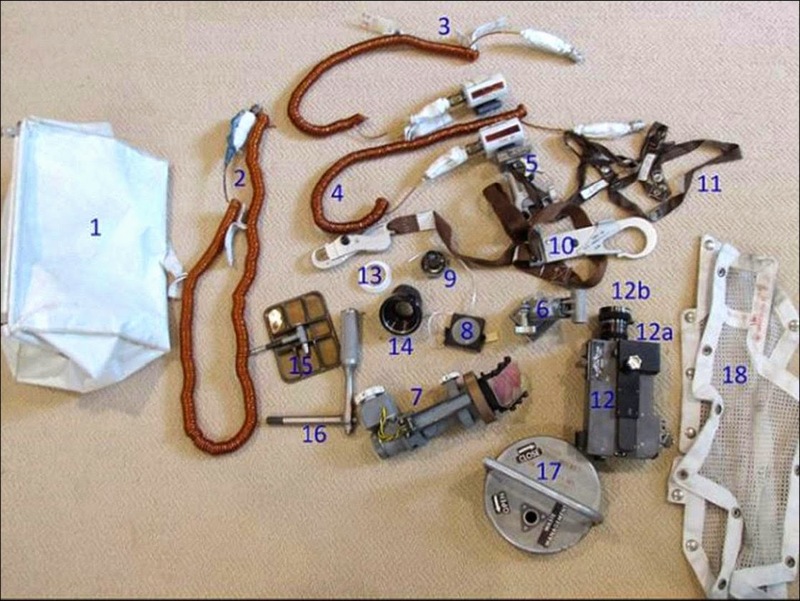 The so-called “McDivitt purse” contained objects carried in the Eagle lunar module during the historic Apollo 11 mission, and included the camera that filmed Neil Armstrong’s descent on to the Moon’s surface on 20 July 1969. 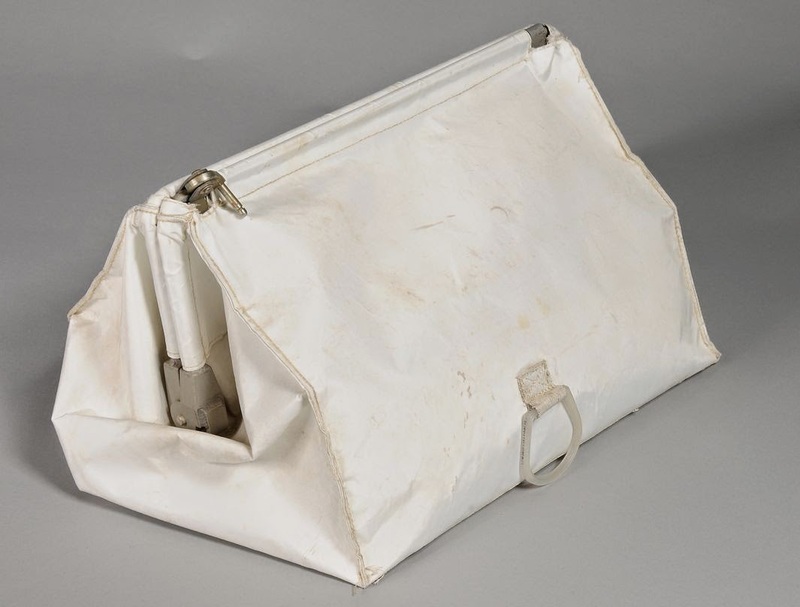 Neil Armstrong’s McDivitt purse, stowed in the lunar module during Apollo 11. The white cloth bag was returned to Earth, despite being scheduled to remain on the moon, and was stashed in Armstrong’s closet until his death in 2012. The objects, which were supposed to be left on the Moon so as to not add extra weight to their capsule on its launch off the lunar surface, will go on display at the Smithsonian National Air and Space Museum alongside other artefacts from the mission. Experts said they were “of priceless historical value”. 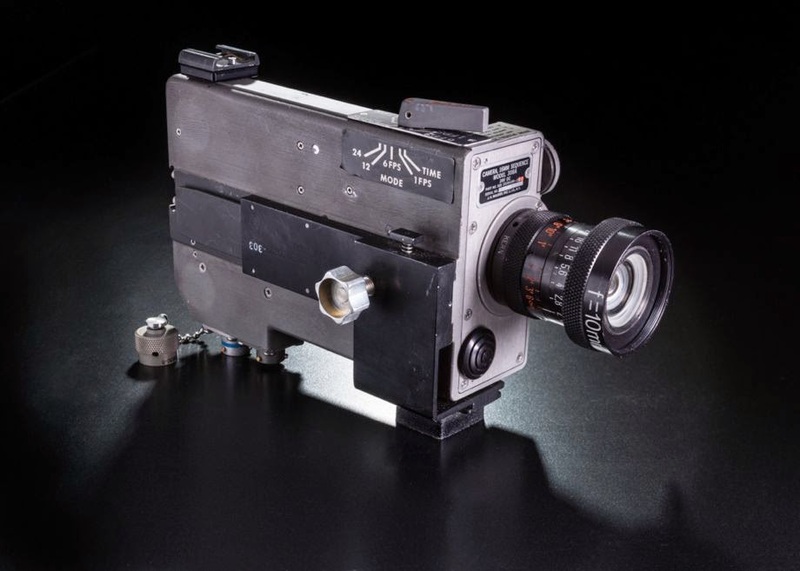 Mounted in the right-hand window of the lunar module Eagle, this Data Acquisition Camera filmed the first landing on the moon. Armstrong and Buzz Aldrin later repositioned it to film their work on the lunar surface. Allan Needell, curator in the space history department at the Smithsonian National Air and Space Museum, said: “Seeing such things with one’s own eyes helps us to appreciate that these accomplishments are not just books or movies but involve real people and real things, and that they involved an extraordinary amount of detailed engineering and planning”. Ms Armstrong found the bag after her husband’s death in 2012 and emailed the curators saying it contained “assorted small items that looked like they may have come from a spacecraft”. 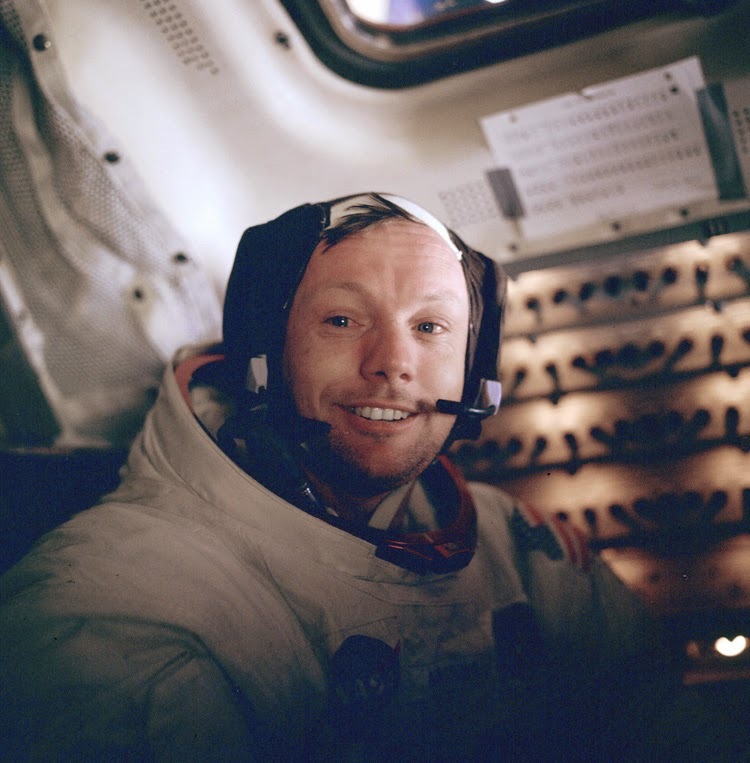 A smiling Neil Armstrong in the Apollo 11's Lunar Module cabin after the EVA. Among the 18 objects were cables, netting, mirrors and the waist tether Armstrong used. There was also the 16mm camera which filmed the landing on the moon and the planting of the US flag, alongside a bracket for the camera, a 10mm lens and a lens shade. They were put in the “purse”, named after Apollo 9 commander Jim McDivitt, who first suggested taking a spare bag to temporarily carry items, as there was no time to return them to storage. A picture still survives of the bag in Buzz Aldrin’s hands in 1969. Armstrong had not mentioned the items to his biographer James Hansen. Two artifacts from the bag, the 16mm Data Acquisition Camera that was mounted in the window of the lunar module Eagle to capture the historic landing and a waist tether that Armstrong used to support his feet while briefly resting on the moon, are currently on display at the museum in a recently opened exhibition. For more detailed information about the purse and its contents, head over to NASA. Swirls of chocolate, caramel and cream, this image is definitely one to trigger sweet-toothed cravings. Smooth cream-coloured plateaus surrounded by cocoa-dusted ridges interspersed with caramel-hued streaks create a scene reminiscent of a cosmic cappuccino. This picture is, perhaps surprisingly, from ESA’s Mars Express, which has been exploring and imaging the martian surface and atmosphere since 2003. We may be used to seeing numerous images of red and brown-hued soil and ruddy landscapes peppered with craters, but the Red Planet isn’t always so red. The bright white region of this image shows the icy cap that covers Mars’ south pole, composed of frozen water and carbon dioxide. While it looks smooth in this image, at close quarters the cap is a layered mix of peaks, troughs and flat plains, and has been likened in appearance to swiss cheese. 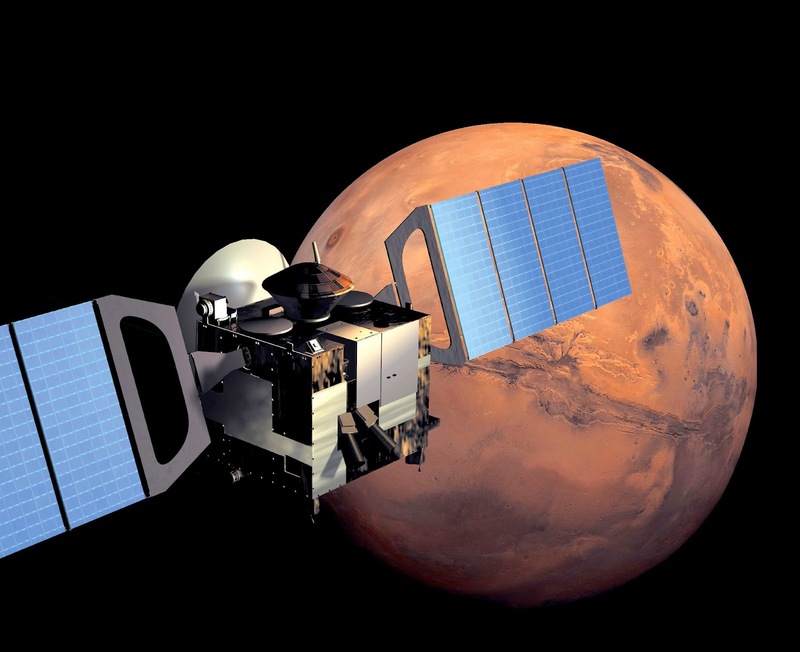 The cap is around 150 km north of Mars’ geographical south pole and Mars Express has shed light on why this ice cap is displaced. Deep impact craters,notably the Hellas Basin, the largest impact structure on the entire planet at 7 km deep and 2300 km across, funnel the strong winds that blow across Mars towards its southern pole, creating a mix of different low- and high-pressure systems. The carbon dioxide in the polar cap sublimates at different rates in these regions with contrasting pressure, resulting in the cap’s lopsided structure. 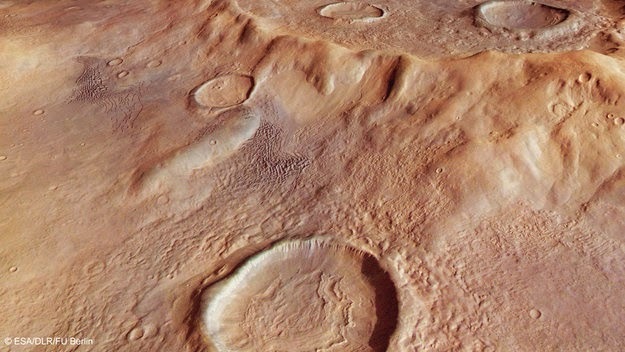 Mars Express imaged this area of Mars on 17 December 2012, in infrared, green and blue light, using its High Resolution Stereo Camera. This image was processed by Bill Dunford, using data available from the ESA Planetary Science Archive. Tropical Cyclone Bansi was seen from the International Space Station. 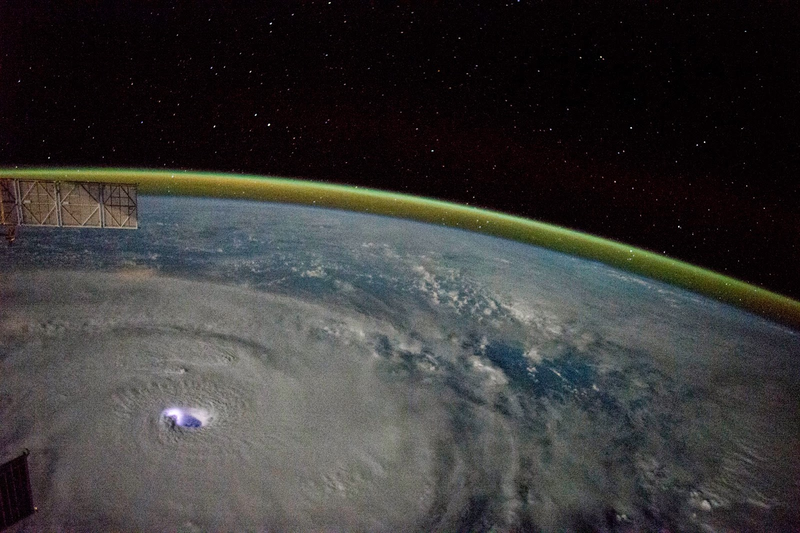 Though this image may look like they come from a science fiction movie, it is in fact a photograph of tropical cyclone Bansi as seen at night by astronauts on the International Space Station (ISS). The image was taken when the ISS was east of Madagascar. Bansi formed in the southwestern Indian Ocean on January 11, 2015. By the time the photo was taken on the following day, Bansi had achieved tropical cyclone strength, with sustained maximum winds over 185 kilometers (115 miles) per hour. The cyclone would reach category 4 strength before becoming a weak extra-tropical system on January 19. The dim swirl of the cloud bands covers the ocean surface in this night image. The eye of the cyclone is brilliantly lit by lightning in or near the eye wall. Image of Cyclone Bansi taken by ESA Astronaut Sam Cristoforetti (@AstroSamantha) on the ISS. 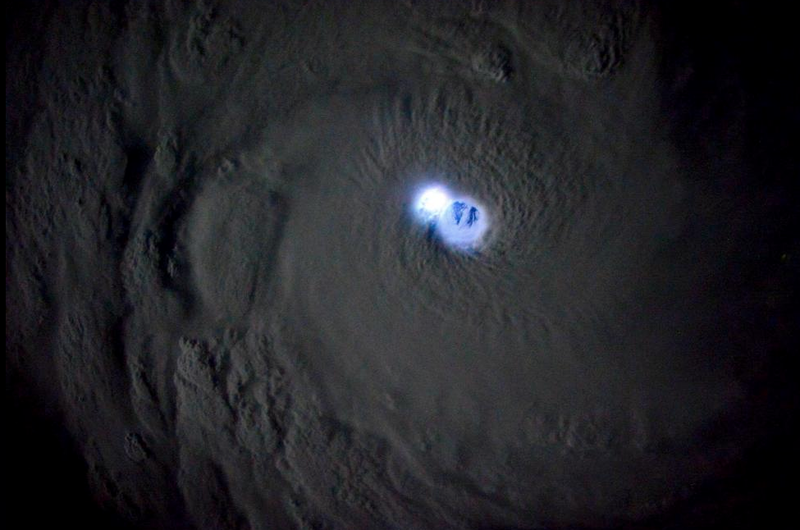 Image shows lightning illuminating the eye-wall of Cyclone Bansi in the Indian Ocean. The low-light settings of the camera used to take the image accentuate the contrast. The camera also accentuates the yellow-green airglow above the Earth’s limb, an atmospheric phenomenon frequently seen by astronauts. Stars appear above the airglow layer, and the solar panels of a docked Russian spacecraft jut into the image (upper left). Astronaut photographs ISS042-E-135015 and ISS042-E-135030 were acquired on January 12, 2015, with a Nikon D4 digital camera using a 28 millimeter lens, and are provided by the ISS Crew Earth Observations Facility and the Earth Science and Remote Sensing Unit, Johnson Space Center. The image was taken by the Expedition 42 crew.They have been cropped and enhanced to improve contrast, and lens artifacts have been removed. The International Space Station Program supports the laboratory as part of the ISS National Lab to help astronauts take pictures of Earth that will be of the greatest value to scientists and the public, and to make those images freely available on the Internet. Additional images taken by astronauts and cosmonauts can be viewed at the NASA/JSC Gateway to Astronaut Photography of Earth. Caption by William L. Stefanov, NASA-JSC. 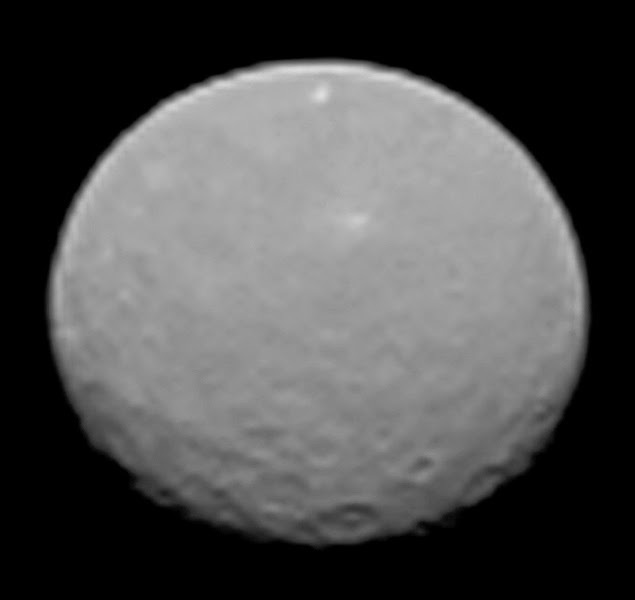 The above image of Ceres, taken on Feb. 4, 2015, from a distance of about 90,000 miles (145,000 kilometers). After the spacecraft arrives and enters into orbit around the dwarf planet, it will study the intriguing world in great detail. Ceres, with a diameter of 590 miles (950 kilometers), is the largest object in the main asteroid belt, located between Mars and Jupiter.